Russia’s corrupt control of Europe: How Vladimir Putin keeps the continent weak. How Russia uses its money and energy muscle to keep Europe weak and divided. 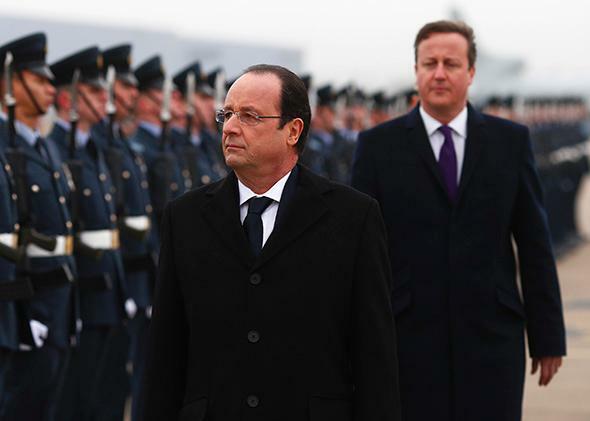 Not even François Hollande, left, and David Cameron are immune to Russia’s gas-powered influence. Which is worse? France sending Russia a ship that could be used against NATO allies in the Baltic or the Black Sea? Or Britain’s insistence on its right to launder Russian money through London’s financial markets? It was an amusing spat, not least because it plays into the stereotypes: Britain versus France, crooked bankers versus cynical politicians. The dispute dominated headlines as Europeans debated the right response to Russian aggression in eastern Ukraine. But in some sense, it also disguises the real nature of Russian influence in Europe. For Russia’s strongest political influence is not in relatively large countries such as Britain or France, where at least these things are openly discussed, but rather in weaker countries that barely have a foreign policy debate at all. None of this influence is a direct product of Russia’s size or wealth. Russia’s population of 143 million people is smaller than that of Nigeria or Pakistan, about the same as Britain and Germany combined, and its economy is about the same as Italy’s. The European Union, which contains 500 million people, sends only 7 percent of its exports to Russia. Though it sounds surprising, Germany now trades more with Poland than it does with Russia. Nevertheless, Russia has political influence in Europe because of the nature of Moscow’s European business counterparts and partners: very large companies, usually connected to oil and gas, that make very large donations to political parties. Even taken altogether, 100,000 German traders and manufacturers doing business in Poland do not have the same clout as the chairman of E.ON Ruhrgas, which has deep Russian investments and investors. All of Italy’s wine and cheese exporters combined do not have the same voice in Italian politics as the CEO of Eni, the Italian state gas company that is Russia’s biggest wholesale gas client. For that matter, the wishes of the saddened, angry Dutch victims of the Malaysia Airlines plane crash may not, in the end, matter as much to the Dutch government as the views of Royal Dutch Shell, which has major investments in Russia, although I hope this doesn’t prove to be true. As they began to do business in Europe in the 1990s, the Russians learned very quickly about the importance of politically connected companies. As a result, they have begun to acquire shares in more of them. Rosneft, the state-owned Russian oil company—now the target of U.S. sanctions—recently bought 13 percent of the shares of Pirelli, a huge Italian tire company. The president of Rosneft, who would be refused a visa to the United States, is on Pirelli’s board. Last year Russian President Vladimir Putin himself came to Italy to announce the creation of a special, billion-euro Russo-Italian investment fund. The result? Italy, not France, Britain or Germany, has most assiduously blocked sanctions on Russia, and Italy is Europe’s biggest supporter of Russian “interests” in Ukraine. Russia’s efforts in southeastern Europe have been particularly notable. In Serbia, which is not yet an EU member, Russian companies control the most important oil and gas companies. In Hungary, Russia’s announcement of a major nuclear investment seems to have helped convince the Hungarian government to keep quiet about Ukraine. In Greece, Gazprom’s attempt to buy out the state gas supplier was blocked by the European Union at the last minute because it came into conflict with EU competition laws. Some of these investments are connected to Russia’s plan to build South Stream, a pipeline designed to bypass Ukraine. But they also help win political influence in countries that have blocking votes at big EU meetings—or, as in Serbia, to prevent them from joining the EU at all. And the ultimate goal? Not money, exactly—if it were, then Russians, like others, would hesitate to invest (in some cases overpaying) in poor markets—but politics: to weaken the European Union, to prevent it from having a foreign policy, and above all to keep it from creating and maintaining a unified strategy concerning Russia. Toward these ends, Russia also backs far-right, anti-European parties that might play a disruptive role in the European Parliament, and Russia conducts an information war at many levels in Europe, too. But money talks loudest in smaller countries, and Russia’s politically savvy investors know it.